An improperly loaded dishwasher by sound noisy. Is your dishwasher on the fritz? While a dishwasher isn’t a necessity, is does make life better. Dishes pile up fast, especially if you have kids. If the dishwasher is down for even a day or two, household routines can be disrupted. 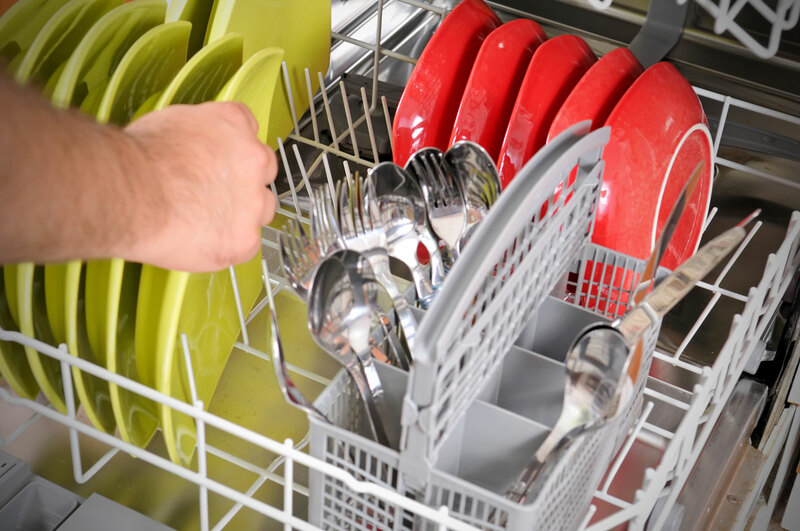 Before you throw in the towel and call a repair service, there are a few things you can do to troubleshoot and possibly fix a misbehaving dishwasher. First, a caveat: If you work on a dishwasher, turn off the water and electricity to the appliance before making any repairs. Here are some quick answers to commonly asked questions about dishwashers. Cracked or brittle seals on the door can lead to leaking. Install a new seal, also called a tub gasket. Make sure you’re using dishwashing detergent. If you use dishwashing soap, suds will overflow the machine. A machine that’s tilting to one side may leak. Use a level to check the appliance. Adjust the legs on the bottom of the machine. Check for and clean a clogged filter. The filter is on the bottom of the appliance. Check that the cycle was completed. If the cycle didn’t finish its run, restart the machine. A kinked or improperly elevated drain hose can keep the unit from draining. Why Won’t My Dishwasher Fill? Is the door latched, the cycle selected, the machine and water turned on? Does the machine have electricity? Check the circuit or fuse box. You could have a problem with the inlet hose. Look for leaks or sediment in the hose. Rhythmic thumps happen when the wash arm bumps items that are improperly loaded. Pause the cycle and adjust the dishes in the rack. Unusually loud bangs indicate a problem. Stop the machine and look inside. Look for items that have fallen or broken. If the noise continues, there could be a problem with one of the parts. You’ll need to call a repair service. Why Don’t My Dishes Get Clean? An overloaded washer doesn’t get dishes clean. Place fewer dished in the machine. Too many large items in the bottom rack can block water from circulating. The ideal temperature for dishwashers is 130 degrees. You may need to adjust your water heater if the water isn’t hot enough. Check the spray arms for blockages caused by food or other debris. 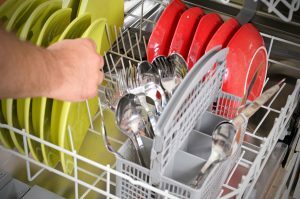 If your out-of-sorts dishwasher is old or can’t be easily repaired, it may make sense to buy a new one. The lifespan of these appliances is about 9 years. Simpson Plumbing can help you install a new dishwasher. Give us a call at 503-313-4827. We’d be happy to help you with a new appliance installation.